YP Simplified Series. Culture transformation & marginal gains – a Nexen culture & efficiency case study. Mike Backus, Nexen Petroleum UK Limited. YP Simplifies Series presents: Culture transformation & marginal gains – a Nexen culture & efficiency case study by Mike Backus, VP Operations UK, Nexen Petroleum UK Limited. 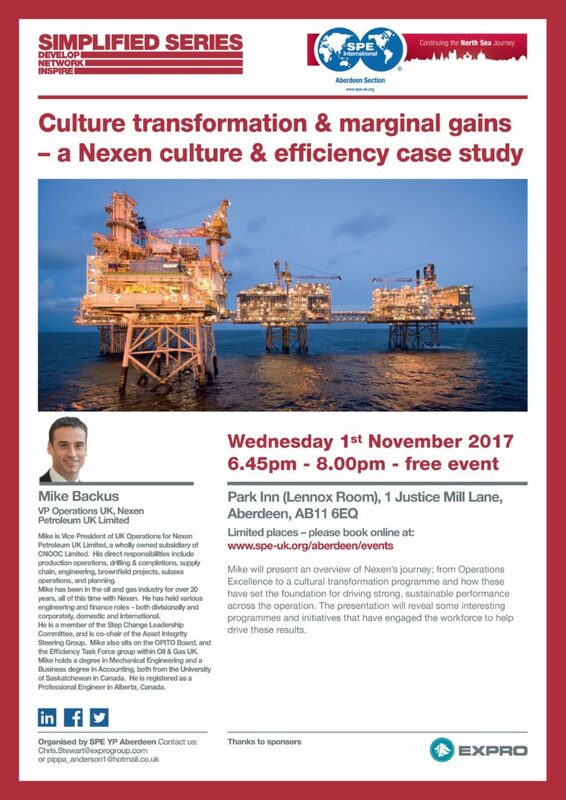 Mike will present an overview of Nexen’s journey; from Operations Excellence to a cultural transformation programme and how these have set the foundation for driving strong, sustainable performance across the operation. The presentation will reveal some interesting programmes and initiatives that have engaged the workforce to help drive these results. Mike is Vice President of UK Operations for Nexen Petroleum UK Limited, a wholly owned subsidiary of CNOOC Limited. His direct responsibilities include production operations, drilling & completions, supply chain, engineering, brownfield projects, subsea operations, and planning. Mike has been in the oil and gas industry for over 20 years, all of this time with Nexen. He has held various engineering and finance roles – both divisionally and corporately, domestic and international. He is a member of the Step Change Leadership Committee, and is co-chair of the Asset Integrity Steering Group. Mike also sits on the OPITO Board, and the Efficiency Task Force group within Oil & Gas UK. Mike holds a degree in Mechanical Engineering and a Business degree in Accounting, both from the University of Saskatchewan in Canada. He is registered as a Professional Engineer in Alberta, Canada.